An ancient secret brotherhood. A devastating new weapon of destruction. An unthinkable target. World-renowned Harvard symbologist Robert Langdon is summoned to a Swiss research facility to analyze a cryptic symbol seared into the chest of a murdered physicist. What he discovers is unimaginable: a deadly vendetta against the Catholic Church by a centuries-old underground organization—the Illuminati. Desperate to save the Vatican from a powerful time bomb, Langdon joins forces in Rome with the beautiful and mysterious scientist Vittoria Vetra. Together they embark on a frantic hunt through sealed crypts, dangerous catacombs, deserted cathedrals, and the most secretive vault on earth—the long-forgotten Illuminati lair. I loved the story mixed with interesting historical information and very well narrated. The plot twists and turns keeps you glued and makes hard to put down. Truly enjoyable. If you have enjoyed The Da Vinci Code Dan and The Lost Symbol like I did you will definitely enjoy this one too. Again I love the narrator too. The only drawback in the narration is that between chapters sometimes he pauses for long time making me wonder if the tape broke or something... lol. Anyway once you learn that it’s normal you just go with it. Not enough negative not to give it a five star. My favorite of his books, keeps you on your toes, hard to put down. Love the historical references and information given with this thrilling take. The narrator perfectly delivers this intriguing story of religion, science, and murder. I prefer to listen to books that I have already read because then I have the characters firmly established in my head, also reading the book then listening to the audio gives a new outlook for me. I have enjoyed listening to this book, not so sure about the narration, definitely not like the voices I had in my head but I enjoyed it. 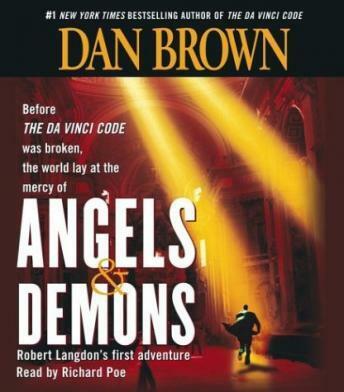 This is my first taste of Dan Brown and definitely my last. The writing is pretty bad for someone so successful, but the story is pure drivel. About 45 minutes in and I could take no more. It is a decent book, but the author likes to make the characters not believe or understand way too much just so he can keep laying out pieces of the puzzle and present shocking details to characters and not the reader so he can again make the character that discovered the shocking details explain it to the unbelieving other character. It is a somewhat small drawback to a decent book. Overall it is a good book with annoying ways to convey the story every once in a while. Pretty good. Some parts of the book seemed to be unnecessary and typical--such as the romance--however the book is very interesting and good. I look forward to seeing the movie. However, since I know Tom Hanks (who I normally like) plays the role of Robert Langdon, I struggled with reconciling the image in my head with Tom Hanks. Oh well! The narration was good. I loved the movie, but the book was so much more complete. Well written and exciting.